Hollywood of the 1960s was in many ways no different than it is today. When you have a big hit at the box office, why not try to recapture that same success. When Planet of the Apes (1968) was a commercial hit, 20th Century Fox was more than ready to go back to Ape City with Beneath the Planet of the Apes (1970). Producer Arthur P. Jacobs was back with Ted Post directing the second release in the franchise. Director Franklin J. Schaffner was ready to move on to his new project Patton following the success of Planet of the Apes. Post was fresh off the Clint Eastwood western classic Hang ‘Em High (1968), which in some ways made him a logical choice considering how many of the scenes were set in the desolate Forbidden Zone. Fox studios wanted Charlton Heston back as astronaut Taylor but he was very hesitant to revisit the role. He finally agreed to a much-reduced presence, ultimately appearing in only a handful of scenes. 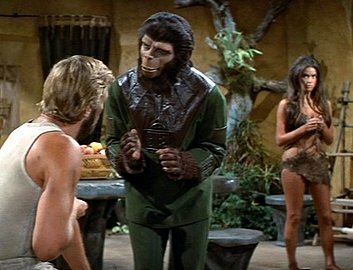 The movie picks up right where Planet of the Apes ended, beginning with a recap of the final scene leading up to Taylor and Nova (Linda Harrison) on horseback, riding off into the Forbidden Zone. Through flashbacks, we see that they encounter fire and earthquakes before Taylor disappears into a cliff wall. Not too far away, we see a crashed spaceship resembling Taylor’s from the first film. The ship’s commanding officer, referred to only as Skipper (Tod Andrews, Hang ‘Em High), dies as fellow astronaut Brent (James Franciscus, Marooned and Valley of Gwangi) begins putting together his whereabouts. They were on a rescue mission for the Taylor’s lost ship, traveling through the same time warp. Brent soon discovers Nova riding on horseback and, upon seeing that she has Taylor’s dog tags, he rides with her to Ape City in search of answers. Once there, he discovers a planet ruled by apes and a gorilla faction hell bent on war. General Ursus (James Gregory, TV series such as Star Trek and Barney Miller) wants to storm into the Forbidden Zone, despite objections from Dr. Zaius (played by the returning Maurice Evans). Cornelius and Zira (again Kim Hunter) have smaller roles here, serving only to essentially set Brent and Nova on their way after he is shot. They are soon captured and, upon quickly escaping with some help from Zira, they head into the Forbidden Zone with a gorilla army not too far behind. Brent soon understands that he is indeed on his Earth just as he discovers a race of underground mutants worshipping an atomic bomb. A collision between apes and mutants ultimately leads to the final conflict that seemingly ended the franchise. Roddy McDowell was not able to reprise his role as Cornelius due to his commitments in directing Tam Lin (1970). David Watson does a very convincing job of playing the character. So much so that I must admit I didn’t realize for years that it wasn’t McDowell, who would return to the role the following year. Several familiar character actors appear as mutants, such as Victor Buono and Gregory Sierra. Natalie Trundy would make the first of several appearances in the Apes franchise playing mutant Albina. While Heston had a very small role, his scenes were among some of the best in the movie, including the final moment involving the Alpha-Omega doomsday bomb. Franciscus did a fine job of taking the lead hero role but something seemed to be missing. This same feeling also pops up when listening to the soundtrack. Jerry Goldsmith’s iconic music for the first film is gone, replaced with a score from Leonard Rosenman, who is well-known for other works such as Fantastic Voyage (1966) and Star Trek IV: The Voyage Home (1986). It works here, especially the gorilla march, but it lacks many of the other-worldly qualities Goldsmith brought to the first film. One of the biggest setbacks in this film is the reduced budget combined with the needs for a larger cast of apes. Unfortunately, this was resolved by having many of the background actors wear masks instead of actual make-up. Look in any scene, especially during General Ursus’ speech, and it is painfully evident. Visually, the movie lacks the overall scope of the original and comes across looking as if it had its’ budget slashed in half. Not surprising because that was just the case. Beneath the Planet of the Apes is a fun sequel despite being much weaker than the first film. Check out the trailer before hunting down the Blu-ray. Of course, it did well enough at the box office to warrant a third sequel, which was quickly rushed into production. Next time, we take a big leap in logic so that we can Escape from the Planet of the Apes (1971). In 1963, French author Pierre Boulle wrote Planet of the Apes. It told the tale of three astronauts who travel to Betelgeuse and discover a planet where apes are the dominant species and humans are savages. Thus, the start of what would become one of the greatest franchises in film history. From 1968 to 1976, the Apes series dominated with 5 feature films, a short-lived live-action television series and a Saturday morning cartoon. Following a Tim Burton reboot in 2001, we are now enjoying a new series of films with a third planned for 2016. And it all started with 1968s Planet of the Apes. Producer Arthur P. Jacobs had purchased the rights to the original novel in 1963 but found little interest in Hollywood. But, after Jacobs began to earn himself a reputation, 20th Century Fox was interested and the project was greenlighted. As the script was being developed, and as in the original novel, the concept of three casts of Apes society was a groundwork that would survive to the final film. There are the gorillas, the more militaristic police force, the upper class orangutans who rule society and the more liberal minded chimpanzees who are the scientists. 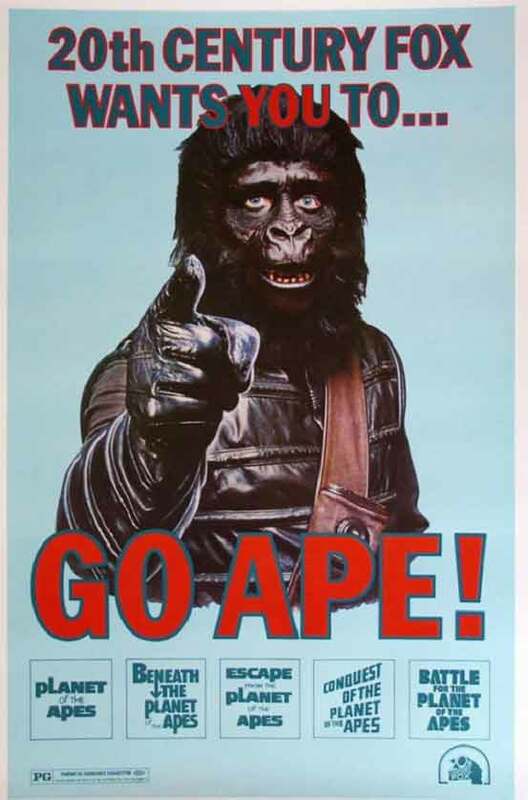 However, the technologically advanced aspects of ape society would be abandoned early on due to budgetary constraints. Legendary Twilight Zone creator Rod Serling wrote an early draft that was rejected. However, elements would be retained in what would eventually be the final draft, rewritten by Michael Wilson. The advanced ape society was now replaced with a more primitive (and cheaper to film) version. What did survive was Serling’s iconic final scene, still one of the best in cinematic history. Planet of the Apes was released in 1968 with top Hollywood actor Charlton Heston (The Omega Man, Soylent Green) in the lead role of astronaut George Taylor. Taylor is the commanding officer of a space mission that includes fellow male astronauts John Landon and Dodge, along with the lone female Stewart. Upon crashing into a lake surrounded by rocky terrain and desert, it’s discovered that Stewart’s hibernation chamber had cracked, leaving her to die before the others had awoken. Our three survivors leave the sinking ship in search of life on this strange alien world. They soon discover a humanoid species that appear to be mute. But before Taylor has a chance to name himself their god and take over the planet, he and the others are shocked to see gorillas on horseback hunting the humans. Fleeing for their lives, Dodge is killed and Landon is knocked over a cliff before Taylor is shot and captured. We discover that apes rule this planet. They are intelligent, using horses and living in dwellings, as well as possessing weapons. However, there is no electricity, so perhaps the best comparison would be that of Earth in the 1800s. Taylor is kept in a cage in what appears to be a zoo where humans are studied. He is eventually befriended by two chimpanzees, Cornelius (Roddy McDowell, It!, The Legend of Hell House) and Zira (Kim Hunter, The Seventh Victim), who believe Taylor to be different. Once Taylor regains his speech, it becomes a race to save Taylor and his mate Nova (Linda Harrison) from Dr. Zaius (Maurice Evans, Rosemary’s Baby), who clearly knows more about man than he is letting on. The final scene is a stunning one, wrapping up the tale while leaving the door open for answers as to what really happened to the world Taylor once knew. There are several aspects of Planet of the Apes which help it stand out as a true sci-fi classic. The script is intelligent, weaving a tale where we ultimately see that the flaws of mankind lead to its’ destruction but are the apes any better? A superior cast enhanced the script, from the main cast to the supporting actors, such as James Whitmore and James Daly. The shooting locations gave it an expansive feel, from the Colorado River in the Grand Canyon to Malibu Creek State Park. And as we are being treated visually, there is an amazing score by Jerry Goldsmith that was nominated for an Academy Award. All of these combine for an amazingly fun flick that is one of my personal favorites. I have very fond memories and watching this movie countless times when I was a kid on Friday and Saturday nights. It not only launched a series of films, but a merchandising juggernaut that included everything from trading cards to action figures to coloring books to puzzles. Not to mention those great book-and-record sets! 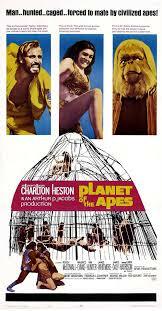 I highly recommend Planet of the Apes and suggest you watch it on Blu-ray as the remastered picture is stunning. Be sure to watch the great documentary Behind the Planet of the Apes as well. Then, seek out the 2011 novel Conspiracy of the Planet of the Apes, written by Andrew E.C. Glaska. It expands on the movie by telling the story of what happened to astronaut Landon between the time he was captured and we see him return, lobotomized and mindless. Amazing illustrations by artists such as Jim Steranko make it well worth tracking it down. Next time, we travel Beneath the Planet of the Apes! Go Ape! Monster Movie Kid Lives Again! More than two months ago, I posted a rather ominous entry. The future of this Monster Movie Kid blog was unclear. However, Desmond over at the Dread Media podcast was indeed correct. He said that I would miss it and that I would be back. Well, Desmond, you were quite right. So…Monster Movie Kid lives again!! Real life has indeed been crazy in the last two months. My wife and I have relocated and now reside in the Kansas City metro area. Our old house closes next week and we’re two weeks away from moving our son to K-State University for his junior year. Not to mention our daughter is applying for jobs in numerous cities as she is set to graduate this fall. It appears that the Chamberlain family may all soon be gone from Wichita and embarking on new adventures. Just today, I discovered that there are 80 movie screens in the suburbs of Olathe and Overland Park alone. There are over 250 screens in the entire metro area with independent films and special engagements at every turn. A paradise for a movie lover such as myself. So, I have set a personal goal of seeing at least one movie at each of the movie theaters. It may take me a while but I’m going to have fun with this challenge. Not to mention great comic book shops such as Elite Comics and three Half-Price Books location within 30 minute. Plus, I am now minutes away from exciting conventions rather than hours. Yes, I am loving it! I quickly realized that I missed sharing my thoughts about some of the films I have seen in the last 2 ½ months. Admittedly, moving and real life has greatly reduced my movie time for now but, as the dust begins to settle, I discovered I really want to dive back into the deep end of the blogiverse. After all, I’ve reviewed every Godzilla movie here, so I surely can’t let the new 2014 movie come and go without sharing my thoughts. 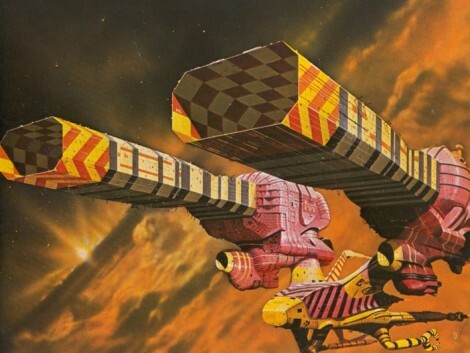 I have Jodorowsky’s Dune waiting to be watched. Not to mention a strong desire to begin revisiting some classic black and white horror flicks. And with fall mere months away, I am glad to announce there will indeed be a 3rd Annual 31 Days of Halloween! Getting back into the groove may take a little while. There won’t be a schedule and I can’t honestly say when the first review will be posted. But just writing for this site is therapy for me. With my wife experiencing some unexpected health issues after our move, I plan to be by her side as we make the journey together. That makes writing even more important for me and played a big part in my decision to get back to it. Plus, there are some exciting things on the horizon regarding some of my earliest articles that I will want to share with everyone when the time is right. Thank you for hanging in there as I dealt with a crazy schedule. Now, let’s return to the business at hand, break out the popcorn and get back to watching some wonderful (and some not-so-wonderful) movies!